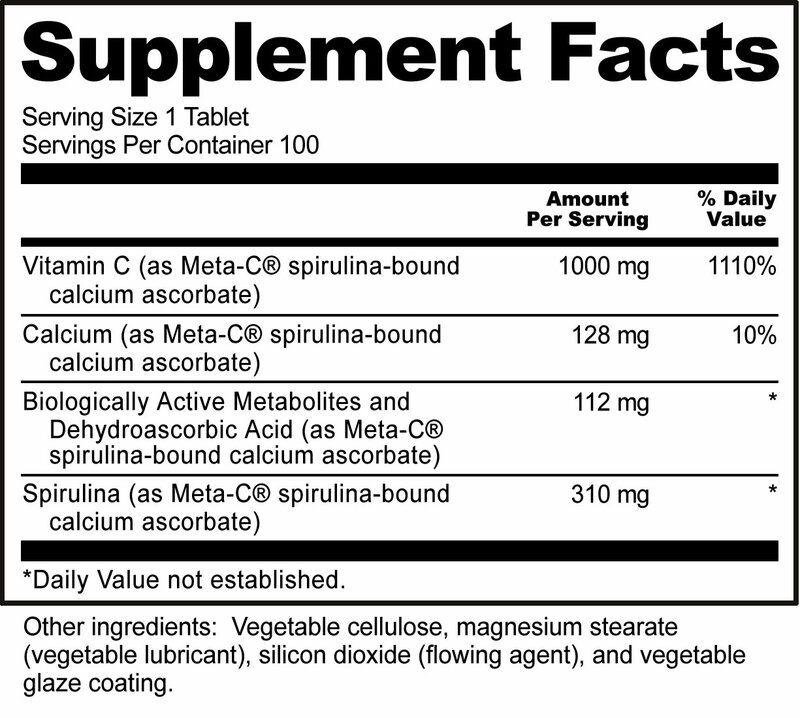 NutriBiotic Meta-C 1000 mg, 100 tabs. Meta-C 500 mg, 100 caps. Meta-C® is a unique, buffered vitamin C that is water-processed at low temperatures with calcium, resulting in high solubility and bioavailability with an alkaline pH similar to blood. The processing conjugates vitamin C with an array of biologically active metabolites in a buffered form as a fully reacted ascorbate of calcium. This calcium ascorbate is then reacted with spirulina (blue-green algae) creating an advanced food-bound nutrient system providing all the properties found in concentrated whole foods such as protein, lipids, glycoproteins, lipoproteins, nucleoproteins (RNA/DNA), complex carbohydrates, phytopigments, flavonoids, fatty acids, enzymes, co-enzymes, trace elements, and fiber. Meta-C® calcium ascorbate, vegetable cellulose, magnesium stearate (vegetable lubricant), silicon dioxide (flowing agent), and vegetable glaze coating. Made without milk, soy, egg, yeast, wheat, colorings, flavorings, or preservatives. As a dietary supplement, take one tablet daily with or without meals, or as directed by a licensed healthcare professional.